I'm fascinated by successful writers. I've decided to launch a new series where I examine authors I admire and try to unlock their secrets to success. 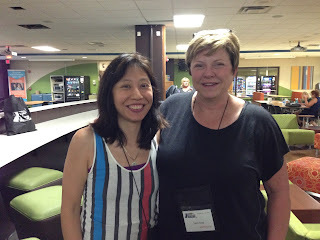 I happened to sit with Tami on the bus, chat with her over lunch, and listen to her speak at the banquet. Here are five pearls from Tami Hoag. I love this. All of us, especially women, are socialized to be nice and kind and “After you” and “Don’t mind if I do.” That makes for a smooth society. But if you want to be a #1 international bestseller, you will have to throw down like Tami Hoag. Well, maybe not exactly like her. In an interview with myPalmBeachPost, she said, "I could knock [you] out with a single punch and can talk about serial killers all day long.” She got into mixed martial arts for stress relief, and rode horses competitively, although she had to heal up five fractured verebrae after a dressage accident in 2003. This may be my absolute favourite line. That was when I realized I have to read more of Tami's books. She is so passionate, so committed to writing, her body reverberates when she talks about it. There are famous authors who want to sit back and enjoy the money and adulation, and I don't blame them, but Tami is still throwing herself into the ring with everything she's got. 3. “Commitment is a four letter word to me. I am a total pantser. In all other areas of my life, I am highly organized." She does get people contacting her to complain that her characters are swearing, but she said she writes exactly how she sees real police officers talking. "I use the vernacular." When readers complain, it "makes me want to go around my office and say #@#%^@# @#^ )()&. @#@"
That made me laugh. Of course, I also like to swear. In other words, trust the process. In the end, even if she has to get her editors to tell her whodunit, or she has to take back a book to rewrite it to her satisfaction, at the end of six or nine months, she's once again created a brand new, character-driven thriller that has a bajillion readers clamouring for more. Do any of these pearls speak to you? Are you a competitor? Is writing or reading your mental full-contact sport? Sound off in the comments. And if you'd like to hear more about Writers Police Academy, I'll be blogging about it at my own personal website. Cheers! Melissa and Tami, I enjoy professional insights and I certainly enjoyed this. Great tips here--and I'm looking forward to more as you continue this series! @Leigh, thanks, and I enjoy your professional insights, too! @Art, that's terrific feedback. Thank you! I love, love, love that line - "writing is a full-contact mental sport"! And she can definitely write. PS - personally, swearing has never bothered me, but then I have a tendency to go into Symphonies in F Major, especially in election years. I enjoyed your post, Melissa. I'll admit I've never read any of Tami Hoag's books, but she definitely sounds like a fascinating, energetic person. I haven't read Tami Hoag & I am not the competitive type whatsoever. But I love “You can't please everyone. It dilutes the quality.” My mother refused to read one of my published stories because I told her in advance it contained the F word. @Eve, I love, love, love "Symphonies in F Major." In fact, that's what I bleeped out of Tami's speech! Great minds (and writers) think alike. @B.K., I'd read her romances when I was a kid, so I'm looking forward to her mysteries as an adult. "Fascinating, energetic" sums it up. @Elizabeth, I hear you. I wrote a whole column about how my mother didn't read my writing for the first..decade? Sounds like you were smart to warn your mother. But as long as people like me and Eve are devouring your F-word stories, you're all right!